BEFORE YOU DIG…IT’S THE LAW! Digging may seem like no big deal, but regardless of where you live or conduct your business, the gas, electric, cable, water, and sewer lines which serve you, may very well be underground. It doesn’t matter how deep you plan to dig, we urge you to call 811 first because hidden dangers could be just beneath the surface. 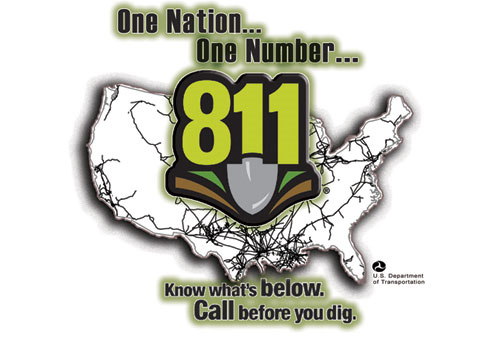 Call 811 at least a few days before you start any digging project. Whether you are planning to do it yourself or hire a professional, smart digging means calling 811 before each job. If you’re planning a project which requires digging, State Law requires you to notify Washington 811 at least two working days in advance of the start of the digging. They’ll come to the location you’d like excavated to mark the buried utilities on your property. Whether you plan to do it yourself or hire a professional, smart digging means calling 1-800-424-5555 or 811 before each job. "It's Free, It's Easy, It's the Law"